So, how do you completely turn off debug with kde4 from svn? that's what I always hoped for, because it's just weird to have applications start up that slow at modern systems. 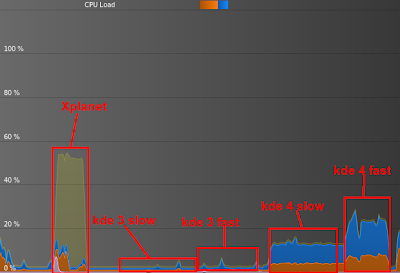 KDE 3 always felt slow because of this. Thank you for your interesting blogpost. It is nice to read an unbiased, empiric view on the performance of KDE4. Users always say "this is faster than that", but they seldom have numbers to prove it. I am still hoping that one day, KDE N will be faster than KDE N-1 and the software bloat will lose. I am certain that performance measurements are the key to victory. Rock on! Switching to a simpler style doesn't seem to help much. @Martin: KDE N is mostly faster than N-1, didn't you notice that over the last few years? @last anonymous: that sounds rather bad... I checked the TT issue tracker and I can't find anything which sounds related - maybe you should file a bug there? Benji w: I can't install QtCurve, it doesn't compile. You could try Quarticurve. ;-) Not as configurable as QtCurve (it's a straight port of the original Bluecurve code, whereas QtCurve has been forked from it ages ago and seen lots of changes), but at least it compiles. ;-) I don't know if it's faster or slower though, the only thing I really cared about is matching the Bluecurve look as much as possible.